The DMF machine is one type of DMF solvent recovery equipment, owning features such as high recovery ratio and low consumption. 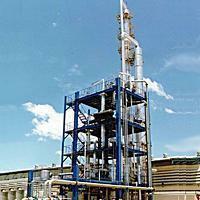 Its heat resources use steam or thermal oil. With PLC programming control design, the operation and maintenance become much easily. What’s more, custom-made order is available. Founded in 1983, Shine Kon has been specialized in manufacturing DMF machine and other whole-plant equipment, dedicating to innovating more advanced machinery. Owing to our endless efforts, we have earned a good reputation both at home and abroad. We are strongly convinced that we can offer every single DMF machine or whole-plant equipment to fulfill each customer’ expectations. We will be your best choice. The custom-made DMF machine is available to depend on customers' requirement of capacity, recovery ratio, recovered DMF and drainage etc. It has high recovery ratio, highly recovered DMF and low consumption. Heat sources used steam or thermal oil.